BARRY M MATTE NAIL PAINT IN CRUSH. 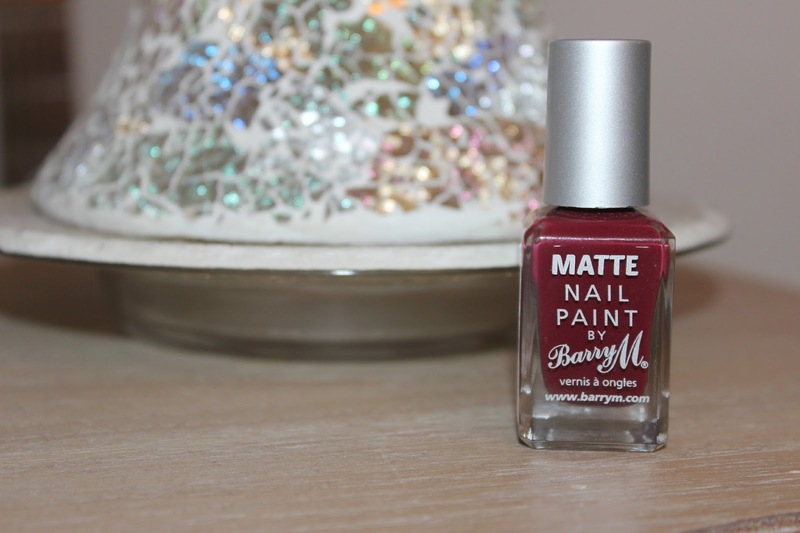 BARRY M MATTE NAIL PAINT IN CRUSH - £3.99. It's coming to my favourite time of the year when you can wear your deepest/darkest shades (not that this doesn't apply to me all year around anyway). Although I have been wearing a lot of pastels this Summer... Essie - Bikini So Teeny being my favourite. There's one thing I wish I could do sometimes and that is to neatly paint my nails. I just haven't got the patience to sit still and always end up smudging them. What I love about this nail polish is the matte finish. I didn't really think I would like it that much and thought it might look a little mucky/grubby on the nails. It turns out that it's my favourite finish and now I want to buy more and more. Isn't this shade (Crush) amazing though? I love me some Oxblood! The longevity of this nail polish is about 4/5 days which isn't too bad at all. Could this be my new 2014 holy grail nail polish? We'll have to see! What is your favourite brand when it comes to nail polish? I'd also just like to say sorry for my lack of blogging this month. I've had a lot going off in my personal life, which meant me putting everything before my blog for a while. Things are slowly going back to normal so I'm trying to get a few posts scheduled now so this doesn't happen again, but just so you know I am alive haha and I hope you're all well! Couldn't agree with you more - dark colours are my all time fave! I have been dying for the cold months now; hats and scarfs bought and the brown lipstick has been dusted off. Ooo I love the colour & the matte finish makes it look extra wintery I love it. Ooh I love love this. I used to have a shade by Barry M called Red Wine and this is so similar, just a matte version. I need!